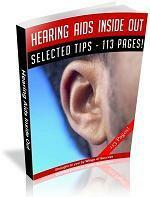 Testing for auditory acuity is the next part of the physical examination. The easiest method of testing for a gross hearing loss is for the examiner to occlude one external canal by pressing inward on the tragus and to speak softly into the other ear. The examiner should hide his or her mouth to prevent lip reading by the patient. The examiner should whisper words such as ''park,'' ''dark,'' or ''daydream'' in the nonoccluded ear and determine whether the patient can hear them. This procedure is then repeated with the other ear. Asking a patient whether he or she hears a ticking watch held to the ear is generally unhelpful because the patient knows what to expect. The use of tuning fork testing for hearing loss is more accurate and should be performed regardless of the results of the whisper test. Although several tuning fork frequencies are available, the best for evaluating hearing is the 512-Hz fork. * A tuning fork is held by its stem, and the tines are briskly struck against the palm of the hand. It should never be struck on a solid wooden or metal object. The two tuning fork tests to assess hearing are the Rinne test and the Weber test.